Bring home the Prestige Elegant Mixer Grinder, your most versatile partner in the kitchen. The 3 stainless steel jars and transparent juicer jar are built to take care of any grinder and juicing need and the 750 watts heavy duty motor is designed to make every task quick and easy. Bring home the Prestige Elegant Mixer Grinder, your most versatile partner in the kitchen. 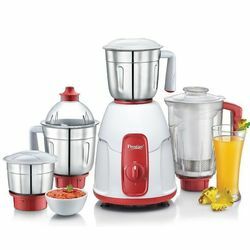 The 3 stainless steel jars and transparent juicer jar are built to take care of any grinder and juicing need and the 750 watts heavy duty motor is designed to make every task quick and easy.